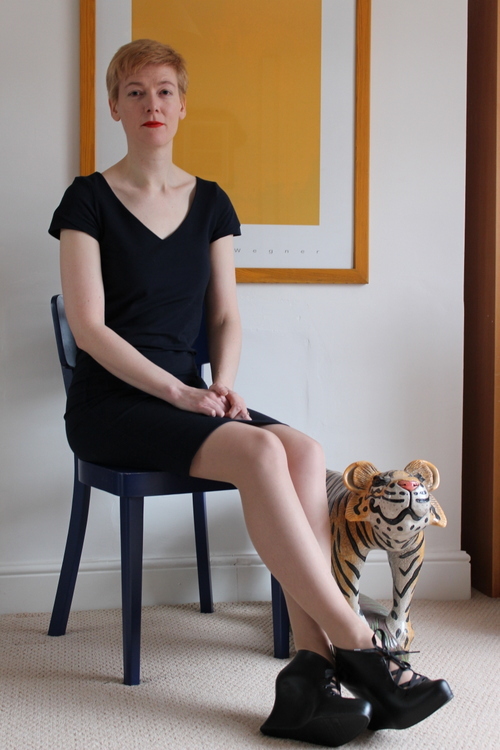 Last week I finally managed to complete a dress I started making at the beginning of May. 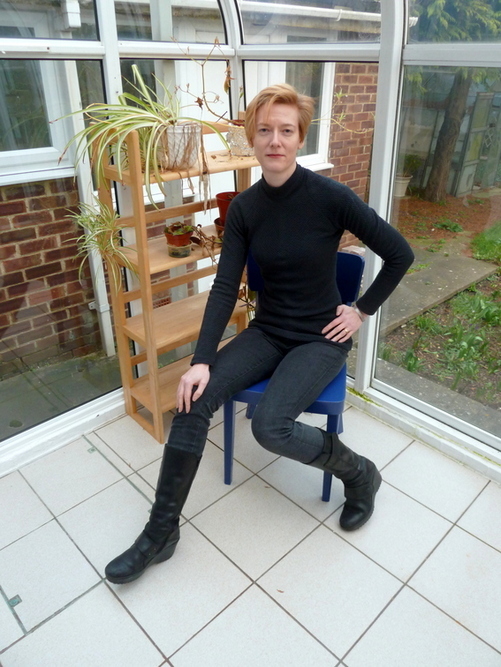 It’s taken nearly a month – real life took over from sewing for a while! 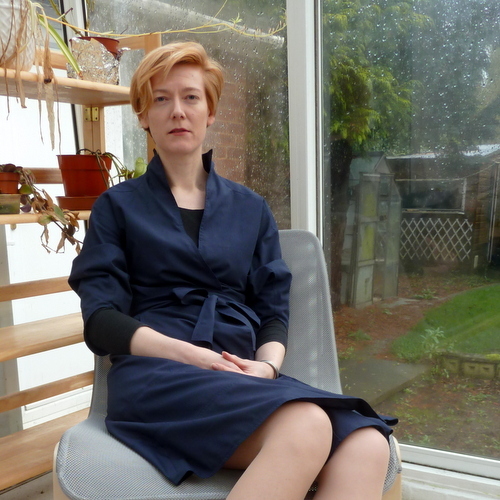 I tried the finished dress on with great excitement, only to realise that the project is a complete failure. It’s wearable enough to photograph under strictly controlled conditions though, so here you go. This is what I was aiming for. It’s Burda 134-06-2012. 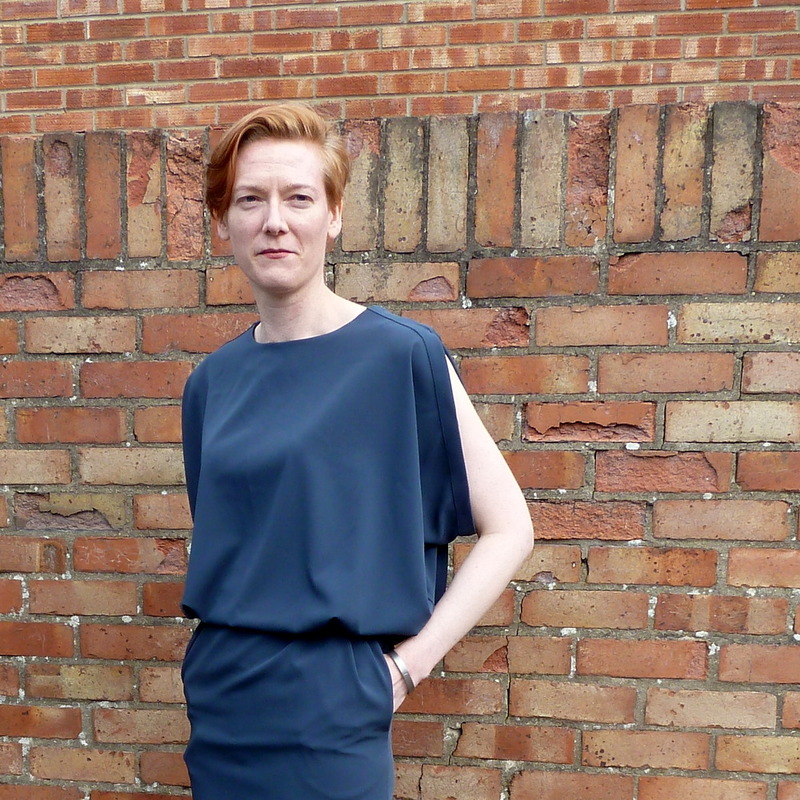 An unusual but comfortable summer dress with pockets. 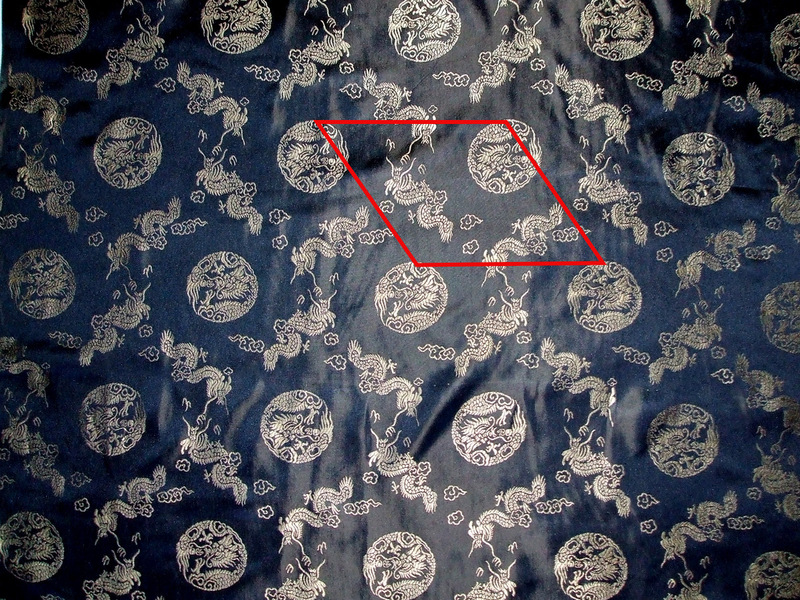 The line art gives a better idea of the shape of the pattern. The fabric recommendation is cloqué. 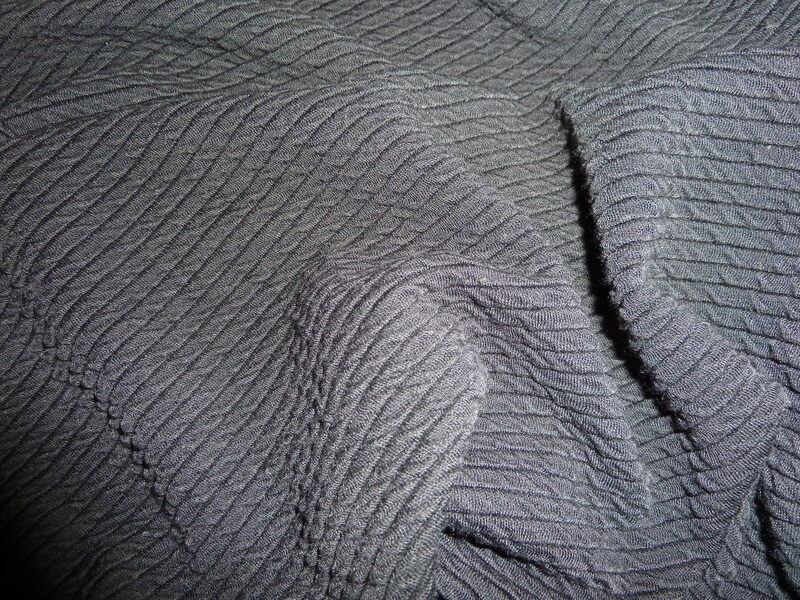 I think that’s some sort of textured woven fabric – maybe a bit like a piqué? I used a mystery twill weave stretch woven I bought in Birmingham last year. It’s a lovely shade of petrol blue and has a slight sheen. And here is my version. It’s a good thing the fabric has a bit of stretch or I wouldn’t be able to get it on! 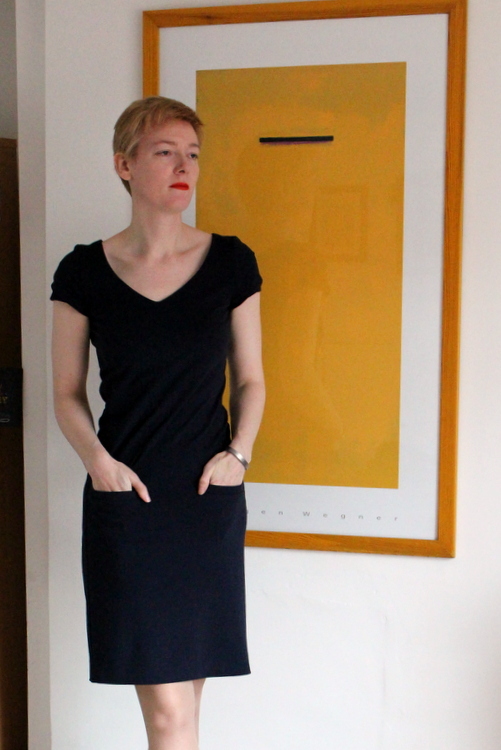 I made my usual size in Burda, but the skirt has come out much too tight over the hips. I really should have gone up a size, or possibly two. The lack of length of the skirt is a problem as well. 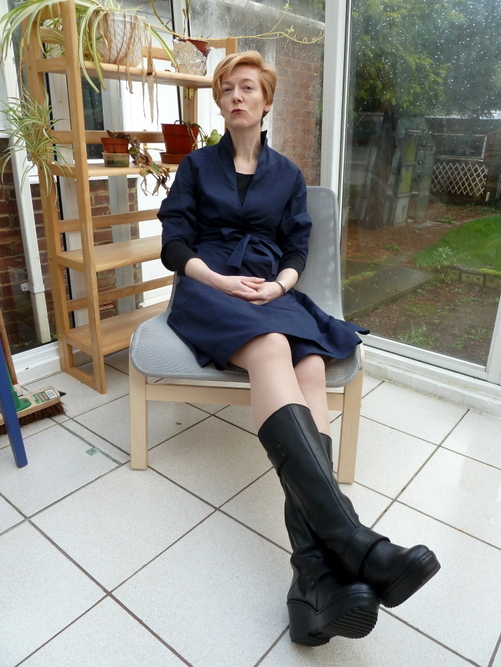 Because of the position of the pockets I have a choice between belting it short enough that the pockets are in the bodice (as Burda has done) or on the hips as I have here. 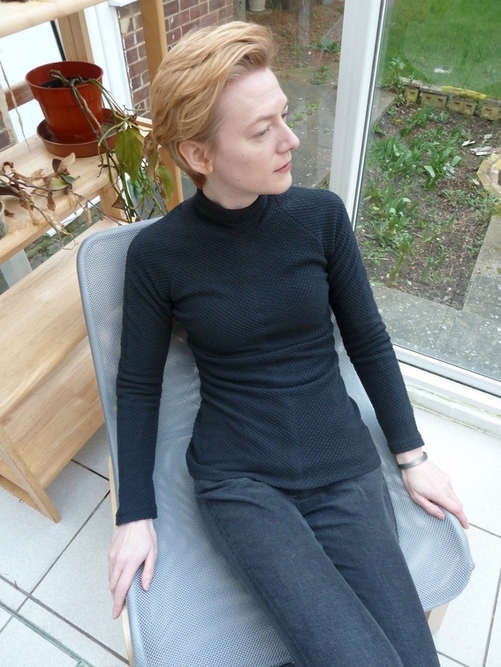 Suffice to say the ‘pockets in the bodice’ look is not one I shall be posting on the Internet. The skirt on my version is unhemmed, so I think this pattern just comes up really short. 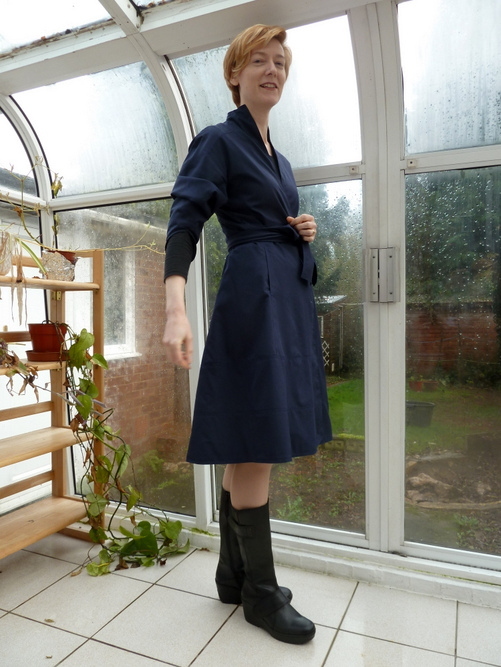 The sleeve bands have worked out quite well considering my fabric is both stretchy and almost unpressable. 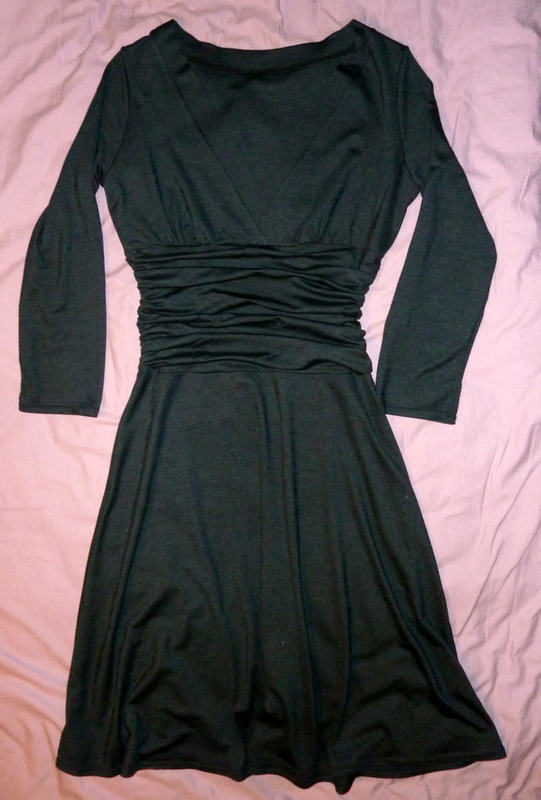 This is definitely a dress to wear a vest under though because the armholes are deep. Don’t know what’s going on with my expression in that picture. 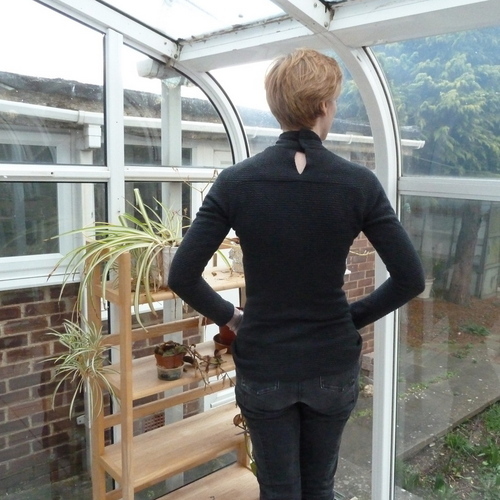 And then there’s the back view. The zip’s definitely too heavy for this fabric. I couldn’t get a matching zip or even a grey one in the right length, hence the beige. 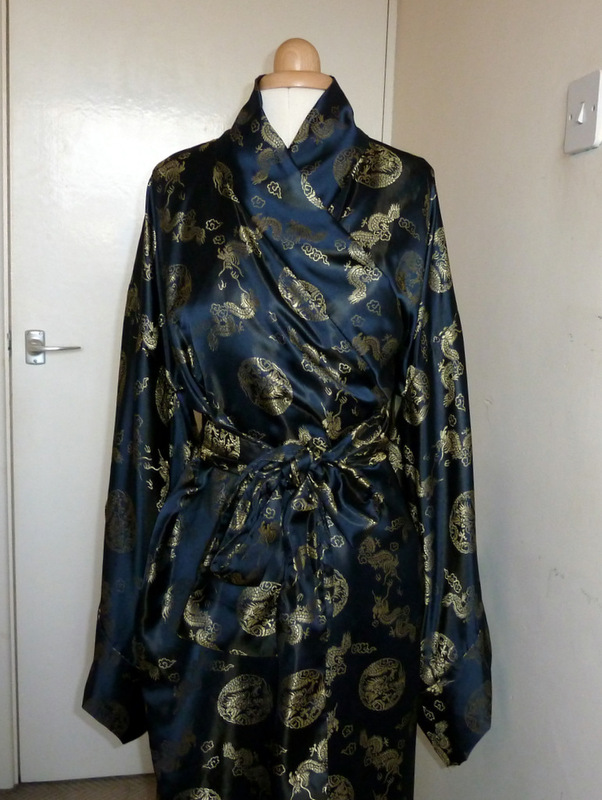 It looked OK against the fabric under artificial light but I’m less convinced now I see it in daylight. The skirt is hanging very badly; again that’s because it isn’t large enough for me on the hips so fabric tends to pool just below the waist. I think there’s a really nice dress in here that’s been killed by a combination of horrible fabric choice and dodgy pattern sizing. Right now I’m dithering as to whether to put the pattern in the recycling or hang onto it for another try in the future with a fabric that’s got more body. This version is going in the scraps bag! One more slightly silly photo to finish with and then never again will this see the light of day. 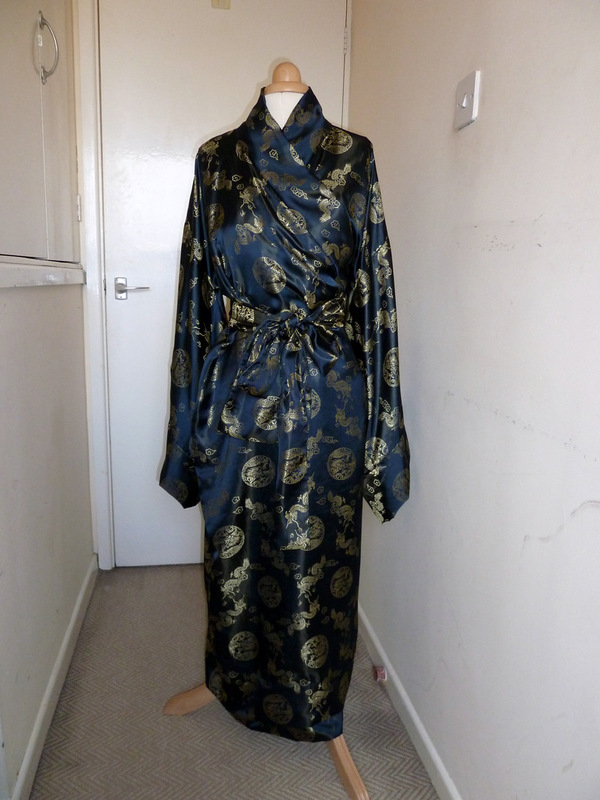 I mentioned a couple of weeks ago I’d been making a kimono for my mother. It is now with her, so I can post some pictures of the finished object! 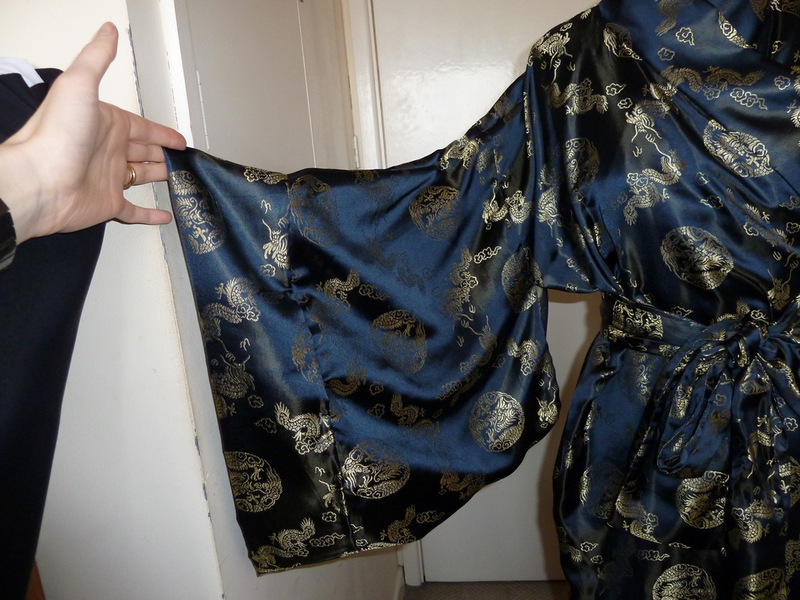 Unfortunately you can’t really see the sleeves when it’s hanging on the dressform, so here’s a better shot. The cuffs were an improvisation because I got the length of the sleeves wrong when I was working out the layout, but I think they work well. It’s not lined. 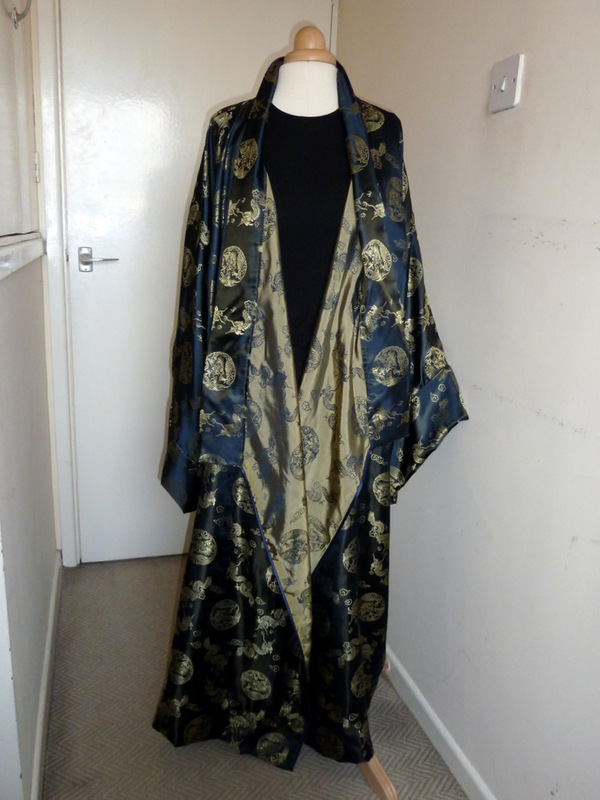 The brocade is a lovely gold colour inside. And here’s a completely gratuitous shot of the seam and hem finish. I’m normally the queen of not caring what the inside of a garment looks like (after all, who’s going to see? 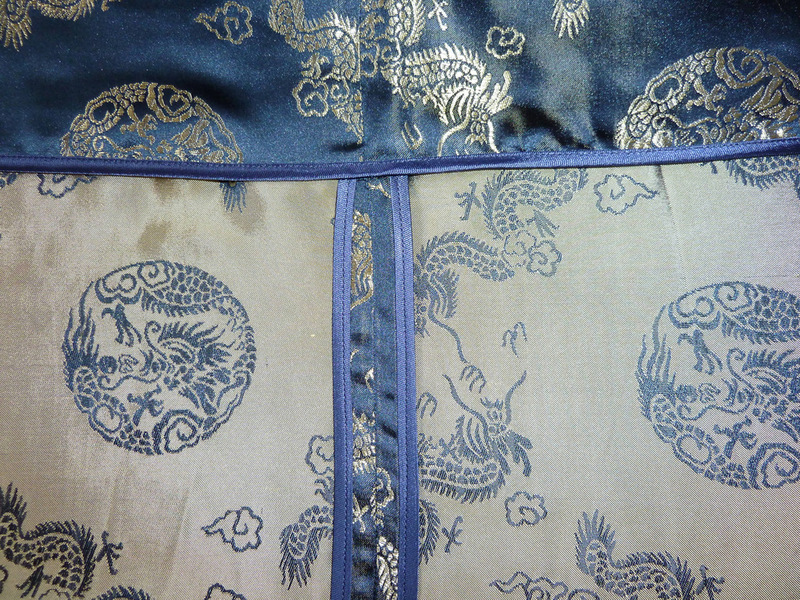 ), but this fabric frayed so much it absolutely required binding the edges. 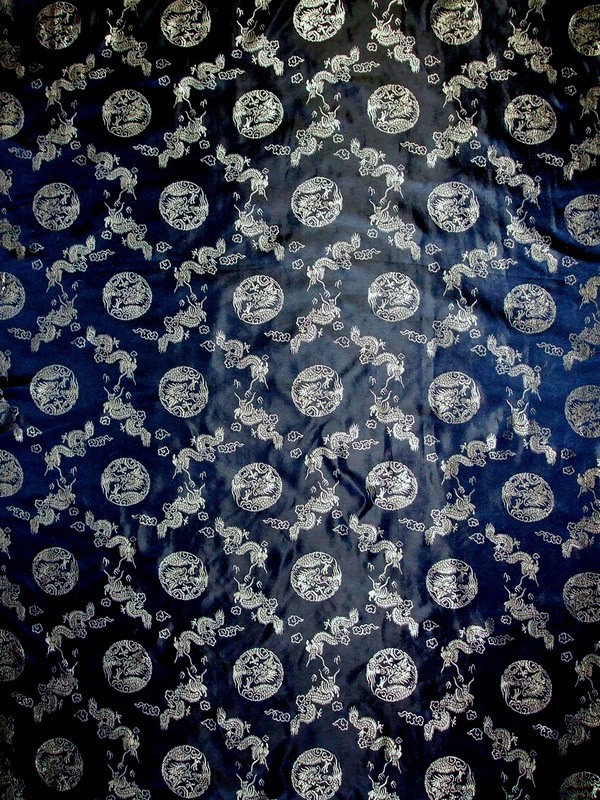 And I will admit it looks nice, but I doubt I’ll be doing this on any well-behaved fabric. 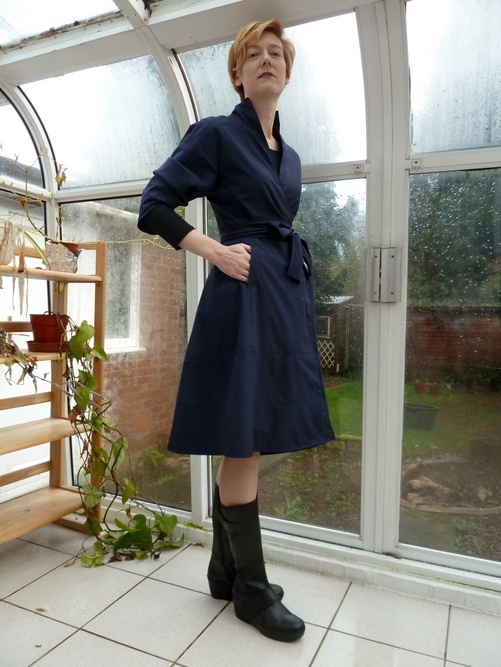 So here’s my version of Vogue 1220 being worn by me for the first time, as opposed to my dressform. I really like it. But it’s not at all the easy-to-wear shirtdress I’d envisioned. This dress is short. I’m surprised by the shortness because the envelope photo shows it stopping on the middle of the model’s knees. I made my usual length adjustments before cutting it out, but I think I’d need to add another four or five inches to get the hem to the equivalent length on me. I am going to have to invest in some very thick tights. On the other hand, it has highly practical pockets. More dresses should have pockets. 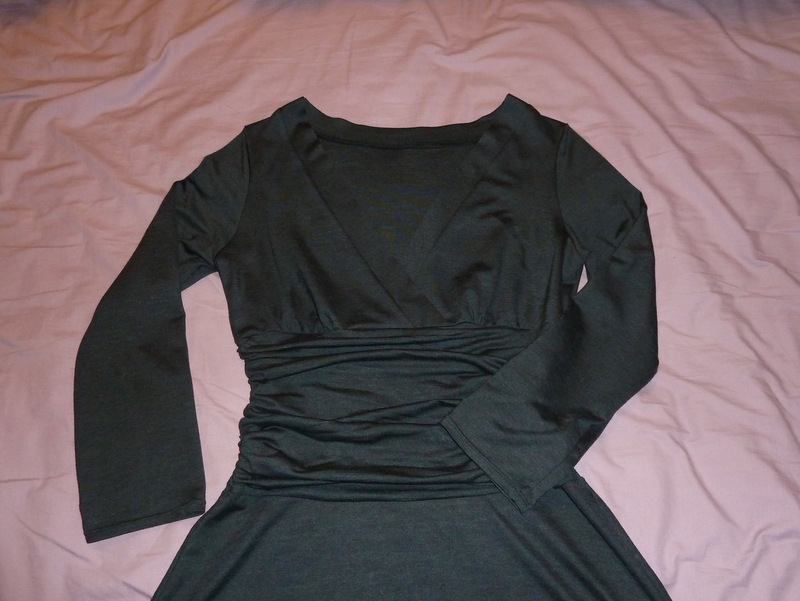 And the little sleeves are a nice change, and I love the pleats on the bodice. Other than the length issue it’s really comfortable. I was worried that there wouldn’t be enough walking ease but it’s come out fine. 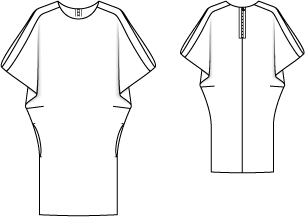 It’s a great design and I really recommend it – but I’m very glad I read all the Pattern Review reviews of it first because the pattern instructions miss out an important step in finishing the placket. Some of the reviews also point out alternative ways to do some of the steps to avoid hand sewing. I’m all for that. I’m definitely going to wear this version, but I think I’ll try making it again and adding some length too.